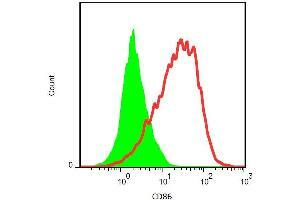 Surface staining of PHA-activated murine splenocytes with anti-CD86 (GL-1) FITC. Specificity The rat monoclonal antibody GL-1 reacts with CD86 (B7-2), a 70-80 kDa type I transmembrane glycoprotein of immunoglobulin supergene family, expressed on professional antigen-presenting cells, such as dendritic cells, macrophages or activated B lymphocytes. Application Notes The reagent is designed for Flow Cytometry analysis.Suggested working concentration is 2 µ,g/mL. Indicated dilution is recommended starting point for use of this product. Working concentrations should be determined by the investigator.